This tutorial is the second part of Dispatcher Timer Windows Workflow Foundation tutorial series. 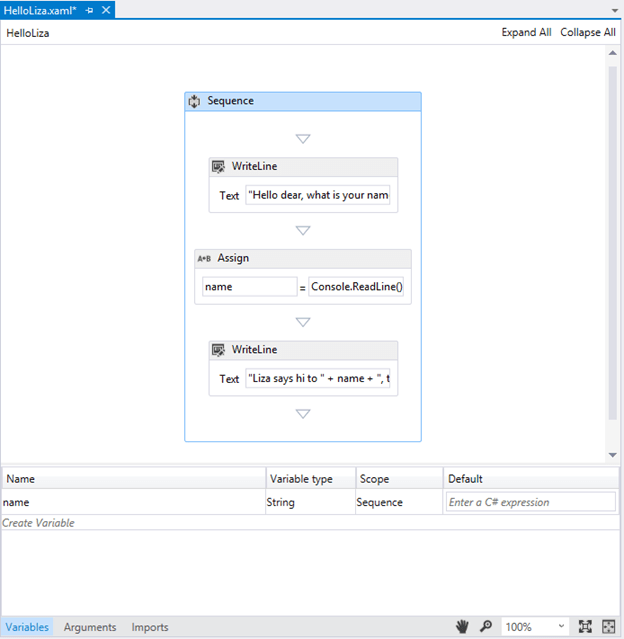 In this tutorial I’m going to show you how you can create a very simple Workflow application to ask the user’s name and greets her using C#. Visual Studio 2013 and .NET 4.5 is used in this tutorial. Task 1: Create a new Workflow Console Application Project. 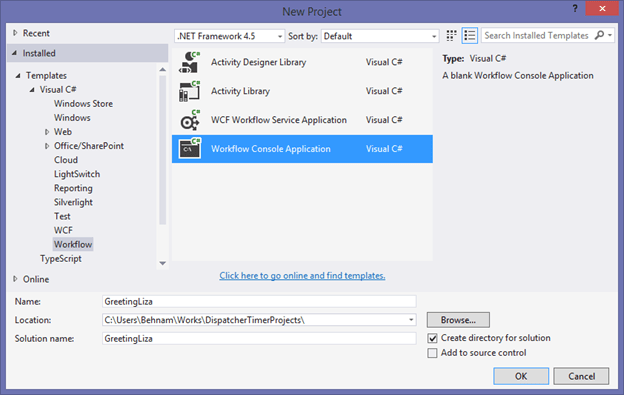 Choose File, New, Project and Select Workflow Console Application under Installed, Template, Visual C#, WorkFlow project type. The Visual Studio will be creating a Workflow1.xaml file for you. Simply remove the file from the solution explorer. As it has been mentioned in the introduction to this WF tutorial series everything in Workflow is an activity. Activities are functional units of a Workflow. They can perform a simple task like displaying massage to the user or more complicated tasks made from combination of different other activities. We are going to use the WriteLine Activity to simply display a message. 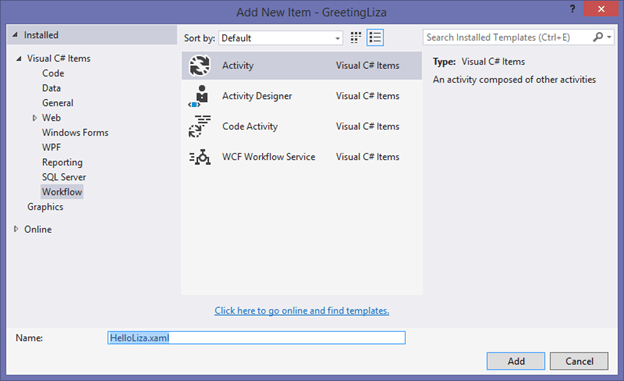 Right click on the Project; Add, New Item, and select Activity from Installed, Visual C# Items, Workflow Item type. The workflow designer will be opened. From the Toolbox (Ctrl + Alt + x) drag and drop a WriteLine Activity under Primitives category into the Workflow designer. WriteLine activity is used to display a string in a console the same way as Console.WriteLine() method. 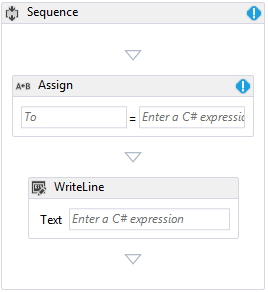 The Text attribute of the WriteLine Activity gets a string or you can enter a C# statement. Select the Text box and enter “Hello Liza”. Let’s run our application and see how it works. Before build the application we need to modify the Program.cs to run our new Workflow. method is used to invoke a Workflow. Why I said simple class because System.Acitivities provides different methods to invoke a workflow. WorkflowInvoker is useful for synchronous execution of workflows. For long-running Workflows or Workflows which use PersistenceStores you need to use WorkflowApplication class. We are going to extend our example and ask the user for her name and to greets her using her name and showing her the current time. To do this we need add Variables to our workflow. From the Toolbox drag and drop an Assign activity above the WriteLine activity which we have added previously. Notice that when you drop that activity WF designer will automatically be creating a SequenceActivity for you. You can see a small blue exclamation mark on the top-right side of the Assign and Sequence activities. This is the WF’s way to tells you that there is an error in the workflow. Initially there is no variable in the list and you cannot even add any. You need to select the activity (the scope) which you want to add the variable to. Select the Sequence activity in the designer. In the Variables tab click on Create variable and type “name” for the Variable Name. In the Variable Type column you can select any type. The default is String which is what we want. Modify the Assign Activity to accept the user’s input. The Assign part of the activity accepts a variable which will be assigned the value provided on the on the textbox on the right side of the equal sign. Any C# expression can be entered to be assigned to the variable. Take note that you can modify the attributes of an activity from the Properties window too. Especially when you are writing a pretty long C# code in the Expression text box which is so small in the WF designer. To do so just click on the activity you want to change its attribute and in the properties window click on the Browse button […] of the Value attribute. 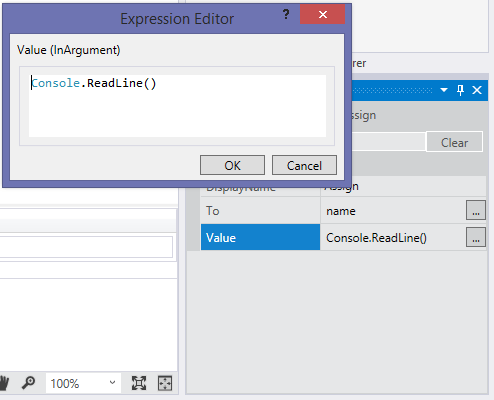 It will open a textbox which is pretty bigger than the designer so you can enter your C# expression there. To show the entered name by user let’s modify the WriteLine activity. You can see we can concatenate a string in the Expression textbox. In the line we are showing a greeting message along with the today’s date. "Hello dear, what is your name?" Thanks for this. Very easy to follow. Please do some more advanced workflow tutorials in the near future. One thing, my console does not pause when it finishes the script but just closes before I can read it. How do I make it wait for the ‘any’ key? Sorry for the late reply. 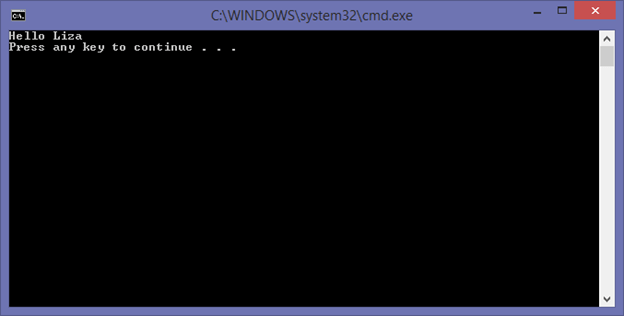 When you run your program you can use Ctrl + F5 so the console wouldn’t be close at the end of execution. Another option is just add an Assign activity at the end to wait for an input from user. And thanks for your comment, I will add more posts on WF soon. This is a great tutorial, very usefull for anyone who want to start learning WF. after this your consoe window will not close no matter which way you are executing your code. Thank you very much for this informative contents Behnam. If you follow the exact steps you should be able to get the expected result. I have updated the post and put the downloadable solution on top of the post. Please download the full project and compare with yours see which step you have missed. If you couldn’t found your issue then send me your project so I see where you made mistake. Really simple! I Really like it! Thanks!